As I was running some errands in our neighborhood today, I came face-to-face with a vicious little bee that was not pleased to see me prancing around on his turf. Clearly I was distracting this bee from his simple yet intense life's duty, and he was NOT having any of it. Bees are the epitome of dedication and diligence - always buzzing about, pollinating, honeying, or defending their flower patch with a kamikaze-esqe fervor. They totally remind me of New Yorkers, haha. Plus, they don't have to worry about the high unemployment rates, bills, and foreclosures...aren't these little bugs lucky? Here's an ode to bees - nature's hardest workers. Oh, and if you haven't made my honey lavender cookies yet, you must! They are amazing plain or as an ice cream sandwich. Plus, here's a fun piece of trivia about the origin of saying 'the bees knees' (because really, what the hell does that even mean? ): "There's no profound reason to relate bees and knees other than the jaunty-sounding rhyme. In the 1920s it was fashionable to use nonsense terms to denote excellence - 'the bees knees', 'the snake's hips', 'the kipper's knickers', 'the cat's pajamas/whiskers', 'the monkey's eyebrows' and so on. Of these, the bee's knees and the cat's whiskers are the only ones to have stood the test of time." Another word from the 1920's that didn't stick around? 'Pollywoppus.' Such a shame. awww to adorable you make an moodboard inspired by cute animals! They are such a hard workers, but did you know that the bee is threatened in its existence? And that's horrible for our Flora. Hopefully it doesn't go so far. I love this! I was in Portobello Road yesterday (its near my dr.'s office), and they had a very cute honey-scented beeswax candle. Lovely post! 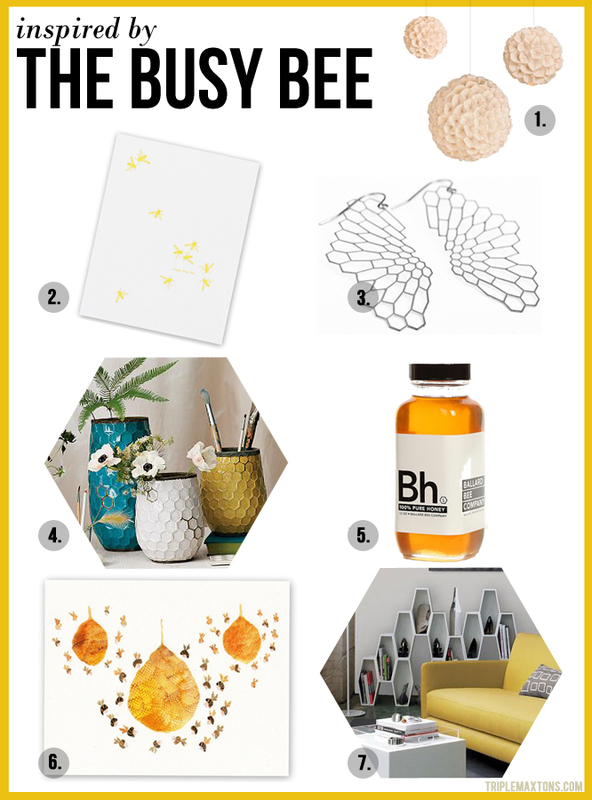 I love the lamps at that bee print :) Have a lovely weekend, sweetie!